Taekwondo and karate are two of the most respected martial arts in the world. Aside from a few rudimentary moves and the fact that they both come from Asia, they are actually quite different from each other, as you will see in this comparison article. Taekwondo is a Korean martial art that is also South Korea’s national sport. The word is comprised of the Korean words, tae, which means "to strike with foot", kwon, which means, "to strike with fist", and do, which means "way" or "art." Taekwondo can therefore be translated loosely as "the art of kicking and punching". Karate is a Japanese martial art that originated from the Ryukyu Islands in what is now modern-day Okinawa in Japan. Karate developed from indigenous fighting techniques known as te and kenpo, which originated from China, and is characterized as a striking art in which the common techniques are punching, kicking, kneeing and elbowing, and open-handed strikes. Some variants of karate also utilize grappling, locks, restraints, and throws. Karate practitioners are called karateka. Karateka typically use the arms or hands 60% of the time, while leg strikes and kicks account for about 40%. This is the case for various forms of karate set routines or katas, which are fight simulations against imaginary opponents. In taekwondo, the ratio of hand-arm strikes versus leg strikes and kicks is reversed, with most practitioners utilizing the legs 60% of the time versus 40% hands and arms. Taekwondo practitioners also tend to launch more high kicks to the head than karate practitioners, in addition to jumping and/or flying kicks. It is also important to note that taekwondo forms and patterns are often shorter and less complicated than karate forms. That being said, certain taekwondo practitioners have been known to use karate techniques as well. 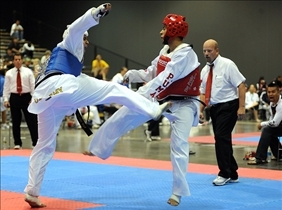 In many parts of the world, karate and taekwondo practitioners compete in separate events. In North America however, the prevalence of open martial arts tournaments has resulted in frequent encounters between practitioners of both disciplines. 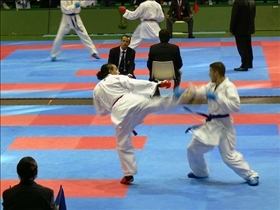 A number of large open martial arts events still feature separate divisions for taekwondo and karate, although the fighting and/or sparring events will often combine both styles. In fact, many black belts are well-versed in both karate and taekwondo. While karate has traditionally been more popular than taekwondo–at least in the West–taekwondo has recently achieved more widespread popularity, thanks to its acceptance as an Olympic sport. In any case, both martial arts are hugely popular all over the world, much more so than any other forms. Can be translated loosely as "the art of kicking and punching"
Which is better for self defense? There are two very distinct styles of Taekwondo: That sanctioned by the WTF (World Taekwondo Federation) and that sanctioned by the ITF (International Taekwondo Federation). The style compared here with karate appears to be the WTF style which is the sporting style used in the Olympics. The ITF style is the style developed by general Choi and is a much more practical and effective self-defence fighting style and is very similar to karate in its balance of hand and foot techniques. Both styles of TKD have their merits depending on what your goal is but they are quite different from each other. Unfortunately they are often one confused with other when discussing martial arts.